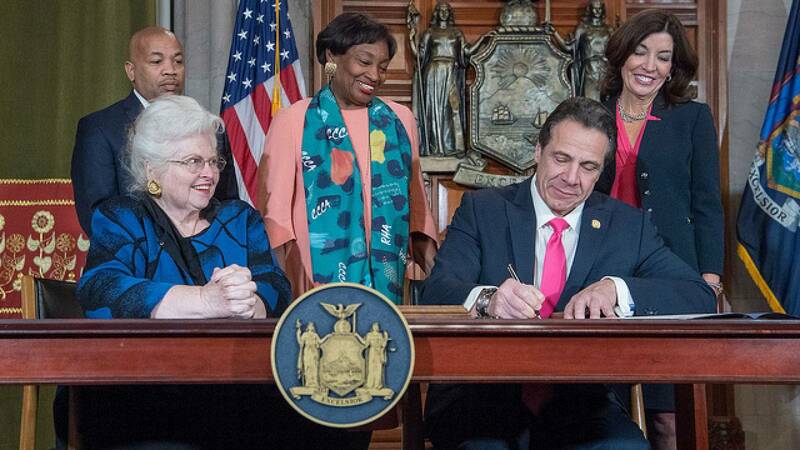 Governor Cuomo signs the Reproductive Health Act into law. The measure establishes in New York state law the right to choose abortion without restriction up to the 24th week of pregnancy, and after that, if the life or health of the mother is threatened or the fetus is determined not to be viable. Senate Democratic Majority Leader Andrea Stewart-Cousins, who achieved her post when Democrats won several seats in last November’s elections, said the bill is a top priority at time when President Donald Trump’s appointments to the Supreme Court threaten the landmark decision. The Democratic-led State Assembly already had approved the measure several times. Assembly Speaker Carl Heastie, speaking at a packed press conference attended by supporters, said Republicans who used to lead the Senate blocked the bill from coming up for a vote for 12 years. “Always, in my heart, I knew the Senate Republicans would never, ever allow this bill to get to the floor,” Heastie said. During debate on the Senate floor, several newly elected Democrats rose to explain their vote, saying the measure is long overdue. Freshman Sen. Alessandra Biaggi said she was a junior attorney in the governor’s office working on the Reproductive Health Act just a couple of years ago, and she was told by others that the measure would never pass. She said that now has been rectified. Republican senators voted no, including Sen. Daphne Jordan, who said strengthening abortion rights contributes to what she calls a “throwaway” culture. Some GOP senators also expressed concerns over what they say is an unintended consequence of the bill. The measure decriminalizes all forms of abortion in New York, even in domestic violence cases where an attack on a woman leads to the loss of her fetus. Sen. Cathy Young, a Republican from Olean, said because of that, the bill takes away some rights from pregnant women. She offered an amendment that would make it a class D felony for “knowingly assaulting a pregnant woman,” whether or not the fetus is lost. “Why aren’t we protecting pregnant women from having their babies taken away from them, especially in such a violent manner?” Young asked. The amendment was voted down along party lines. The Senate sponsor of the Reproductive Health Act, Liz Krueger, said all of the state’s major anti-domestic violence advocacy groups back the measure. And she said there are already multiple crimes that the perpetrator of assault on a pregnant woman can be charged with. “We have very strict criminal statutes for when people attack people,” Krueger said. Opponents, including the Catholic Church and some evangelical Protestant groups, said they are saddened by the vote. Both houses of the Legislature also approved a measure known as the Comprehensive Contraceptive Care Act that would ensure that New York’s women have access, through their health insurance policies, to affordable contraceptives.